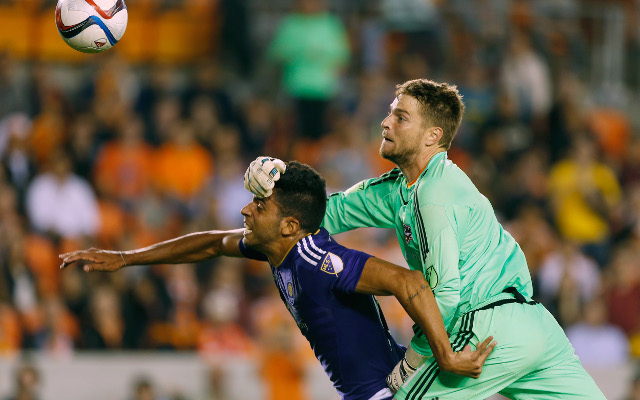 Orlando City bagged their first ever win in MLS, with a narrow 1-0 victory over Owen Coyle’s Houston Dynamo, thanks to a comical own goal from the Dynamo’s keeper Tyler Deric. (Video) Funny! Who does the best ‘hair whip’… MLS star or TV presenter?! Late in the second half, Deric received the ball from a routine back pass, but a heavy first touch played the ball right into the path of Orlando striker Pedro Ribeiro. The keeper can only attempt to smash a clearance away, but the ball hits the forward and loops back over his head. In a last ditch attempt at a recovery, the 26-year-old tries to punch the ball out for a corner, however, he sends the ball – as well as the two players – into the bottom corner of the net.